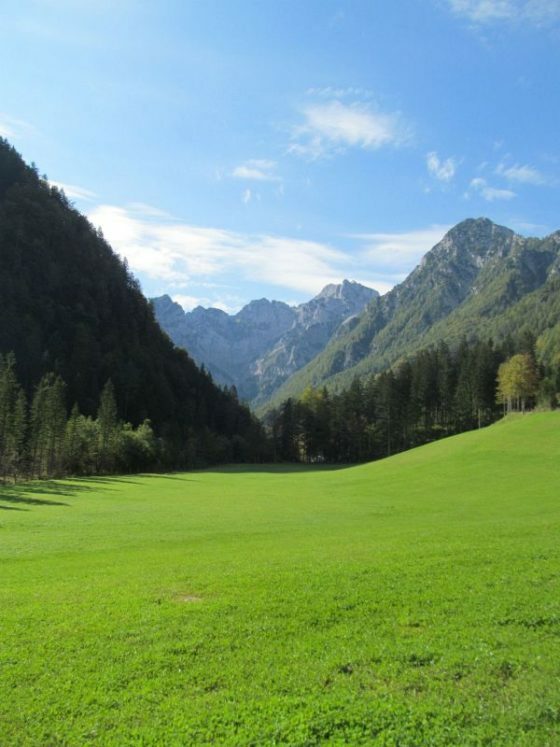 If you are looking to get a little off the beaten path in Slovenia and have a little slice of the Slovenia mountains nearly to yourself, the Logarska Dolina (Logar Valley) should definitely be on your Slovenia itinerary. The Logar Valley is a wide, glacial valley an hour and 45 minutes north and west of Ljubljana. 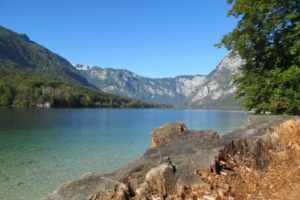 It is surrounded by some of the best Slovenian mountain scenery in the country (equal to or more beautiful IMHO than what we saw in Triglav National Park). 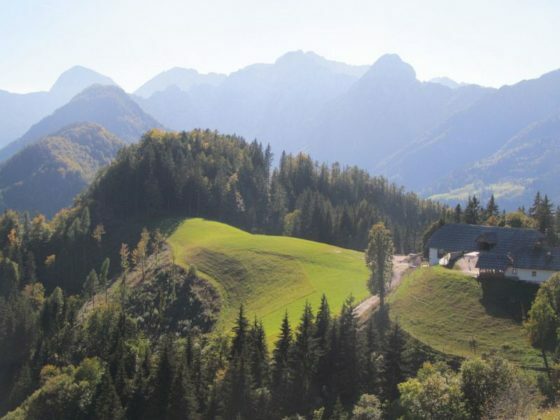 In addition, the tourist farms along the Solcava Panoramic Trail welcome visitors and offer home made Slovenian cuisine and a look into rural Slovenian life. The Logar Valley as well as the nearby Robanov Kot and Matkov Kot valleys have been designated as a protected landscape park since 1987, preserving much of the region’s cultural heritage largely intact. The Logar Valley and surrounding area exist sort of like a fairy tale, outside the boundaries of normal time. Things move at a slower pace here. My busy brain took a little while to get used to the fact that there were no take out coffee shops or take out food and that EVERYTHING was closed on Sundays. Folks that live here still live their lives largely governed by the cycles of the seasons as the area has maintained deep ties to its agricultural heritage. Seeing people successfully growing food and raising animals in this alpine environment made a big impression on my heart. The farms seemed to work in harmony with nature, providing sustenance yet never taking more than they give back nor defiling the landscape. It made me realize that if they can grow food and raise animals on steep, mountainous hillsides as their ancestors have done for generations, we could all make a bigger effort to grow some of our own food on our largely big, flat American lawns. The Logar Valley / Logarska Dolina Slovenia is a beautiful region that is a little out of the way and off the main tourist path. The out of the way nature of this place is actually a bonus because it keeps the tourist crowds down. Because it takes a little effort to get out here, I suggest spending a minimum of 2 nights here to get the full experience and not feel rushed. This is not really day tripable from Ljubljana. You MIGHT be able to drive here early in the morning, see everything and drive back to Ljubljana but it would be a long day with a lot of time in the car. Solcava Slovenia is the main town in the region. It has the tourist information office, a small grocery store and one restaurant with good, cheap pizza and other quick foods. 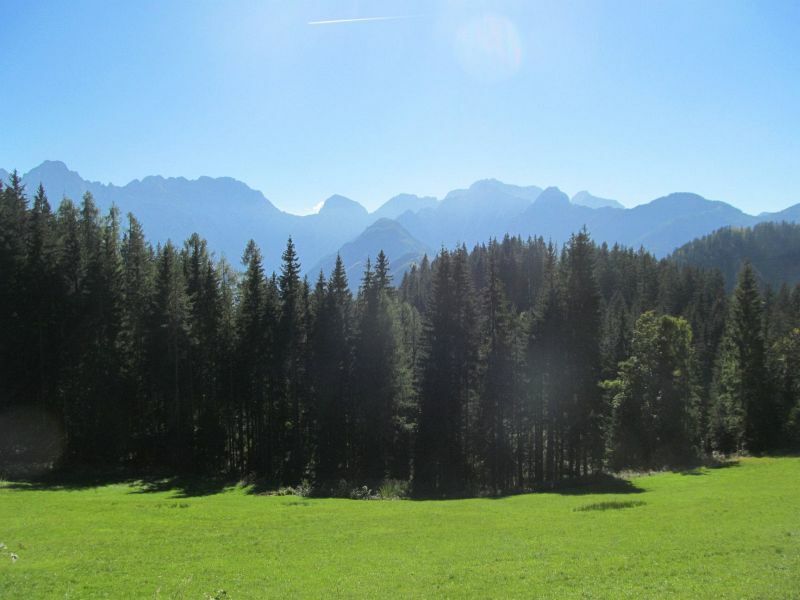 The Logar Valley Landscape Park is near the Solcava Panoramic Trail. This is a network of roads that showcases some of the best Slovenia mountain scenery in the country. The Solčava Panoramic Trail consists of three mapped and marked routes that wind through this section of the Slovenian alps. 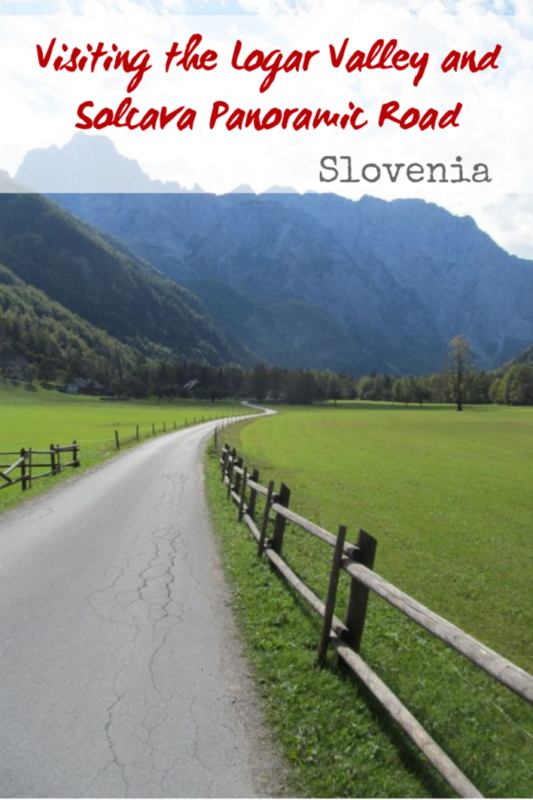 Along the road you will delight in many scenic pullouts as well as a wide variety of Slovenian tourist farms that welcome visitors for farm fresh local food, drink and other locally made goods. The routes are mainly driving routes, but there are hiking opportunities available and marked on the visitor map. 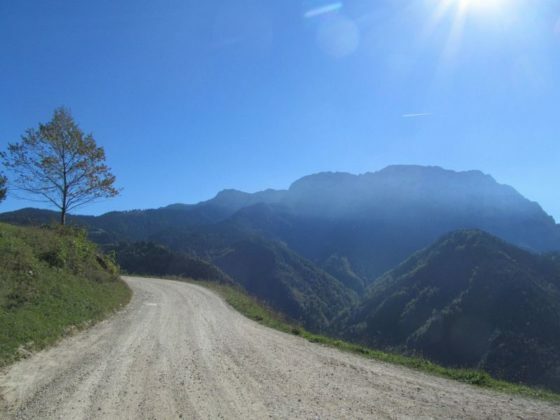 One of the well maintained dirt roads that make up the bulk of the Solcava Panoramic Road. Our first day was spent driving the main “green” route on the Solcava Panoramic trail as well as the shorter “orange” route. We spent our second day exploring the Logar Valley and Slap Rinka as well as the short “blue” route. The Solcava Panoramic trail is a little bit of a work in progress. The roads of the trail are still gravel but very well maintained (though I did see progress towards pavement being made). We felt very safe driving here. Just like many other alpine regions in Slovenia, sometimes the roads are only one lane and you have to pay attention to traffic ahead and pull over if you won’t be able to pass. We spent two days and three nights here with our 3 and 5 year old. We felt that this was an adequate amount of time to see this region by car, though there will always be more to do for those that love hiking and adventure sports. You could easily spend a whole week exploring absolutely everything that they valley has to offer. This is the hub of activity for the region. It houses the tourist information office, a post office, a cafe and an exhibit and film to watch about life in the Solcava Valley and its history. This is a good place to start your explorations. They also sell a wide variety of local, handmade items and food products, so it is a great place to stop for souvenirs and gifts! The Solcava Panoramic Road consists of one main driving loop and two shorter driving loops with some adjacent hiking trails. One of the highlights of the road are the many tourist farms that happily welcome guests offering homemade produce during the summer months. We missed out on this traveling at the end of September as many of them were closed. The roads are truly some of the most scenic that we have ever driven on. The Solcava Panoramic Road and farms that are on it are carved into the steep hillsides of the mountains. As we drove, we saw lush green alpine meadows above and below us with cows grazing lazily. The scenery for more and more dramatic as we rose higher into the mountains. 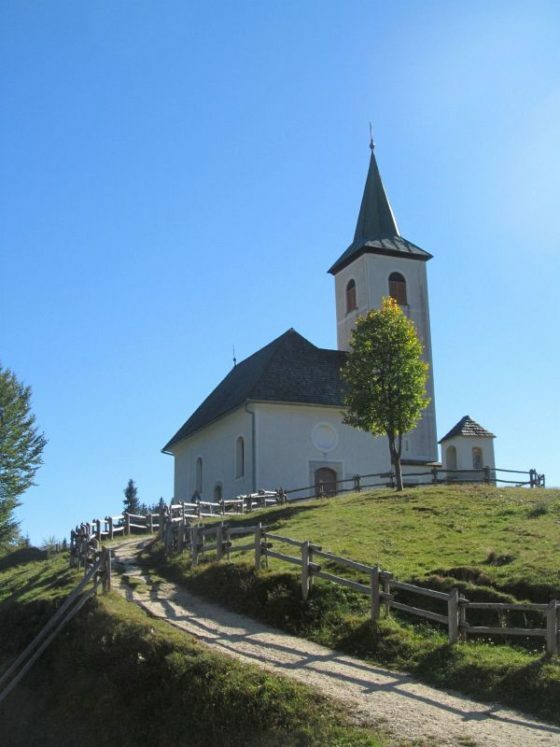 We saw stunning alpine churches and the Tourist Farm Klemencek which is one of the most beautiful and most photographed places in Slovenia. The Klemencek Tourist Farm, one of the famous, noteworthy viewpoints along the Solcava Panoramic Road. One of the picturesque churches along the Solcava Panoramic Road. The great thing about the Logar Valley is that it offers many opportunities for easy walking along its level bottom. This is some of the only truly “easy” hiking in the area, for those with kids or traveling with elders who can’t go on long or difficult hikes. You can walk or drive as far as you want down the valley. If you don’t want to do any hiking, you can drive to the end of the valley and from there it is a 15-30 minute hike to Slap Rinka (it would have been 15 minutes without little kids…it took about 30 with them). Slap Rinka is an easily accessible waterfall at the far end of the Logar Valley. The hike from the parking area is listed at 15 minutes. There are bathrooms in the parking lot as well as a small snack stand. The trail was easy, but it took us 30-45 minutes in the real world with two small children. Slap Rinka is a tall, skinny waterfall that drops precipitously off the edge of a high cliff at the top of the Logar Valley and falls down a long way to the rocks below. The waterfall is worthwhile and the views down the valley from there are picture worthy. Slap Rinka at the far end of the Logar Valley / Logarska Dolina. The Potok Cave is an important archaeological site above the village of Podolseva. Many important remnants of ancient history have been found here, including the oldest needle in Europe. Many of these are on display at the regional museum in Celje. You can see the sewing needle in the Rinka Center (tourist information) in Solcava. 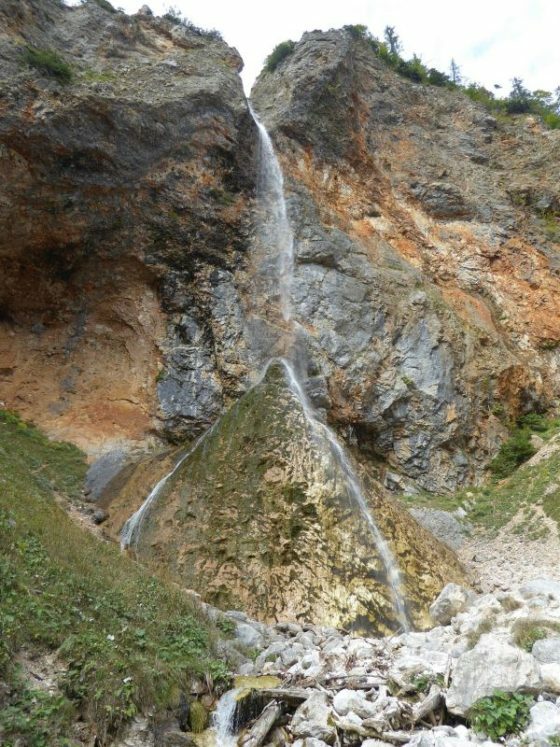 The Palenk waterfall is located on the eastern side of the Logar Valley near the Hotel Plesnik. It falls for 78 meters down the rough face of rocks and it is more impressive after some rain. The Fairy Tale Forest is a magical place that your kids will LOVE! 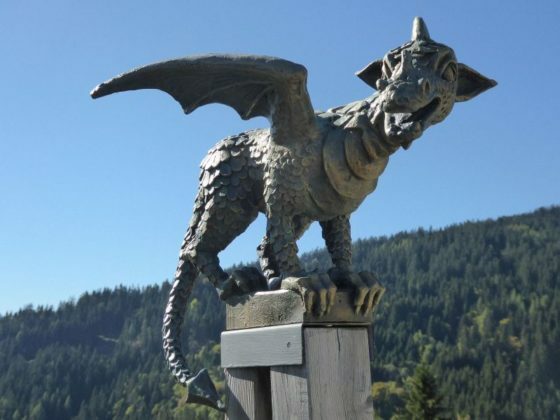 This easy family walk will take you through a series of fairy tale scenes from Slovenian folklore and others from around the world, each made out of natural and recycled materials. The trail leaves from Guest house Na Razpotju, and the forest has a children’s play area. 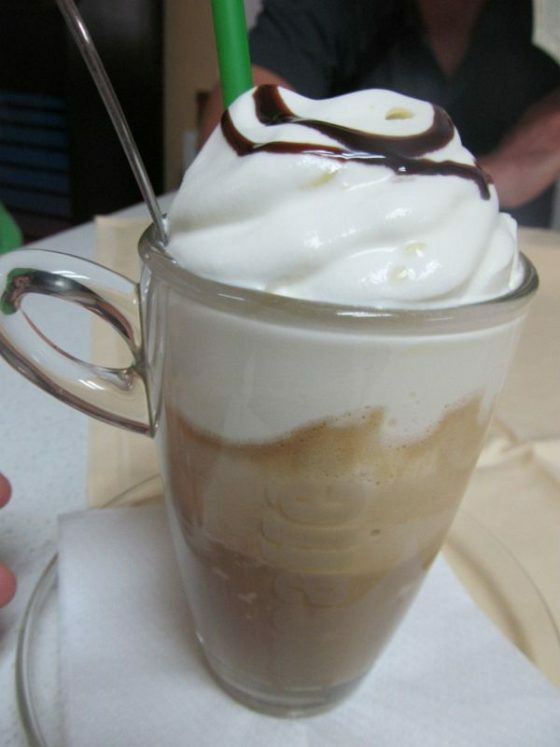 Ledena Cava, a super amazing dessert like Slovenian version of iced coffee. Okrepčevalnica Zadružnik: This is a quick, casual restaurant in Solčava called Okrepčevalnica Zadružnik. They have indoor seating as well as lovely outdoor seating by the river. They offered quick pizzas, decent salads and some local food specialties. The prices were extremely reasonable and it was a great restaurant to eat at with kids for simple meals. This is where I tried my one and only Ledena Kava (a really amazing Slovenian rendition of iced coffee that is more like a dessert) and some really yummy ravioli with cracklings on top (a local specialty). Gostlina Pr’Lampi: This restaurant is located just a few minutes down the valley from Solčava in nearby Luce. They offer a nice variety of traditional Slovenian cuisine at a reasonable price. It gets good reviews on Tripadvisor and seems to be particularly family friendly. Plansarija Logarski Kot: This restaurant is located within the Logar Valley. Reviews indicate truly wondrous views, good hearty Slovenian fare and some space and a playground for kiddos to burn off some energy. Sounds like a winner in our books! Out little home away from home for three nights at Tourist Farm Ramask, near the Logar Valley Slovenia. One of the highlights of our visit to this region was our stay at Tourist Farm Ramsak in the Logar Valley. Our apartment was great and very adequate for our family of five. 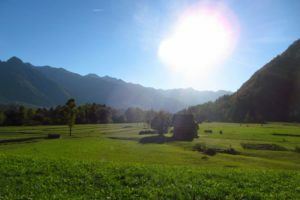 We were well cared for and the experience of our farmstay added depth to our Slovenian travel experience. The tourist farm that we chose is located outside of the Logar Valley itself. We were happy with our choice as the scenery was still amazing and the rates were significantly cheaper than the farm stays that are located within the valley. If you are not able to book at the same tourist farm (which we highly recommend – here is a link to our detailed review) there are a number of tourist farms in the vicinity and I am sure that you will enjoy a pleasurable stay at any one of them. Tourist Farm Govc-Vrsnik is located in the nearby Robanov Valley. It offers really, truly amazing views and rooms to accommodate various family sizes. Breakfast is included in the price, and you can add on lunch or dinner at your leisure. There is an easy 45 hike that you can embark on from here to the Robanov Planina, an alpine meadow and dairy farm where you can sample local cheese and other goodies. Guesthouse Planinski Dom Majerhold was on my radar when we were in the planning stages for our trip to Slovenia. I loved this place because of the views and the amazing fire pit in the yard. They offer a number of different apartments with bed configurations for all sizes of groups, and the description of the meals served here sounds tantalizing and very much home made. 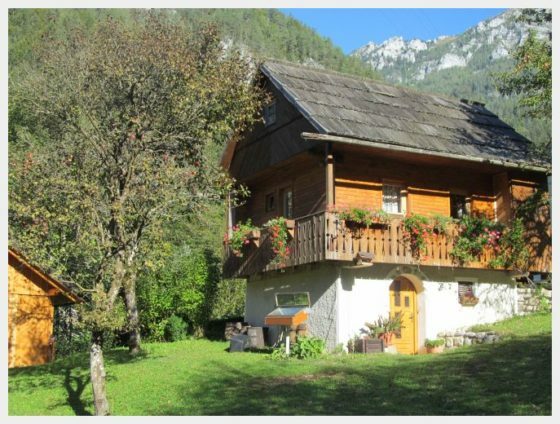 I would not hesitate to stay here on a visit to the Logarska Dolina Slovenia. 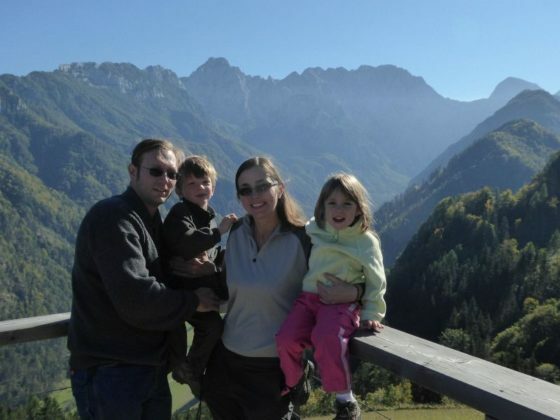 From Ljubljana: The Logar Valley is one and a half hours north east of Ljubljana, Slovenia. Renting a car and driving is the best way to get here. You can get here by bus, but it is not convenient. You would need a bus from Ljubljana to Celje and then another bus from Celje to Solcava in the Logar Valley. Here are details and a timetable for getting to the Logarska Dolina by bus. From Lake Bled: The Logar Valley is one hour, 45 minutes east of Lake Bled. To get here, you will take the main highway halfways back towards Ljubljana and then turn off near Kranj to head north to the Logar Valley. I was unable to find a way to get there from Lake Bled by bus. 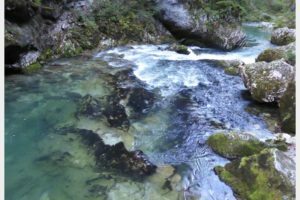 Here are some local travel resources for planning your trip to the Logarski Dolina / Logar Valley Slovenia.